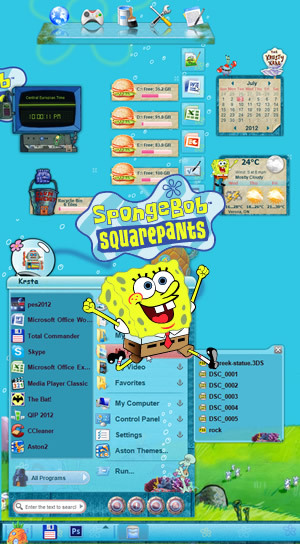 Theme comes with two presets which you can access via Theme Wizard. One is with animated falling snow and the other one is static so you can use the one you fancy more. You can check the large screenshot and instruction for the icons I have used can be found in my previous themes. Have fun and enjoy using Aston. Great theme for Christmas season. Fully animated with tons of features. Check out Youtube video and try it yourself. Halloween theme that will blow your mind, really cool animations and nicely crafted widget skins for pure enjoyment. 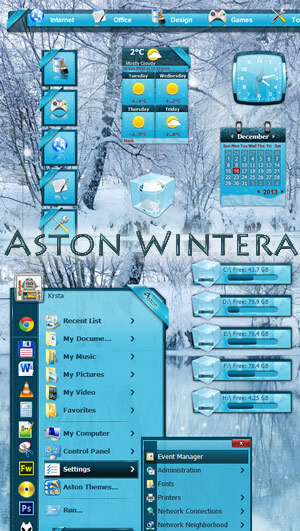 Aston theme that had to be made. My fingers are numb of playing gta 5 on xbox but luckily I had found some time to give my PC a matching look. 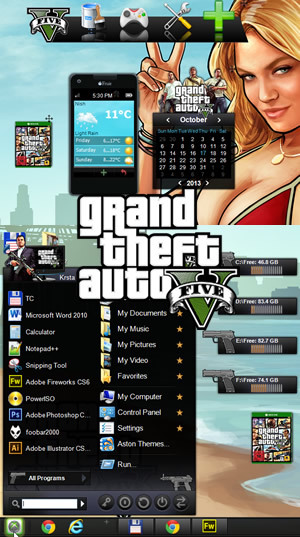 Theme comes with two wallpapers and two configuration which you can access via Theme Wizard. Please drag clock widget over weather widget to achieve the look as seen on screenshot. Something special for the holidays. This year we move indoors with classic red and green color combo spiced with interesting and smooth animations and Christmas look and feel. Nano Threat theme for Aston2. Theme is packed with cool features and effort has paid off well at the end..I think. Dunno the author of the wallpaper but I would like to give him credits since its really awesome. Something cool and hot at the same time :). So what other name to give to the theme. For best look right-clik clock and set time format to "h:mm:ss tt". Theme comes with many cool widget skins if you think that desktop is way too crowded remove the widgets that you don't want. Easy as that. I have used this cool girly wallpaper but any blue or black and blue wallpaper will look great. 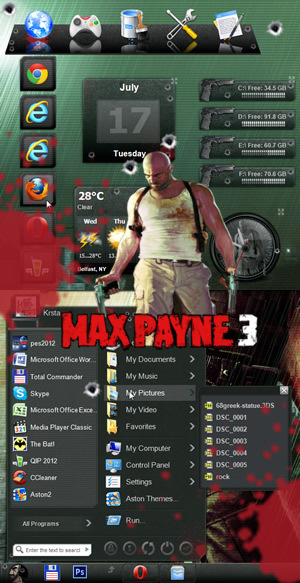 Max Payne 3 theme. Great game deserves a great theme and this is really something that took me lot of time and effort to finish it. I played the game while I was making it so it was really enjoying experience. If someone finds toolbar icons too large please use Launchbar widget instead. I have tried to capture the game atmosphere so it has some gory details but so does the game. with this fan skin for all ages. Theme is fully animated and if you have ideas on improving this theme feedback is welcome. All copyright belong to neckelodeon so visit www.nick.co.uk for more Spongebob stuff.